Here is something for NAC seminarians, especially, as you walk from the heights to the Centro. There is something interesting to see just off your usual beaten path. Today is the feast of St. Teresa of Avila. There is an interesting story about the Teresa and our present, modern Julio-Gregorian calendar. In 1582, the ancient Julian calendar (organized by, yes, Julius Caesar and still observed by many Orthodox Christians) officially was terminated on Thursday 4 October by the command of Gregory XIII (1572–1585, Ugo Boncompagni) via the papal bull Inter gravissimas. At midnight of 3-4 October the calendar skipped automatically to a day named Friday 15 October. The famed Jesuit mathematician Christopher Clavius (+1612) worked out the calculations for this change. He chose October for the moment of the jump because it had the fewest feast days. He also did his calculations without the use of the decimal point! St. Teresa of Avila died on the very night on which His Holiness had commanded that the calendar shift from 4 October to 15 October, which is why her feast is celebrated on the 15th rather than the 3rd or 4th. If you are in Rome, stop at San Salvatore in Lauro and look at the chewed up little fountain to the left of the main doors of the church. It will probably be obscured by parked cars. On this little fountain is what’s left of a lion. Over the fountain there is an inscription which inter alia speaks of a draco or “dragon” who, dutiful (pius), masters the whole world (draco qui toti pius imperat orbi). This is a reference to Pope Gregory XIII whose coat of arms bore a dragon with wings outstretched. This is the Pope who ordered the change in the calendar and after whom we call our modern calendar Julio-Gregorian. In the cortile of Via dei Prefetti 17 is the inscription that was on the fountain of the “wolf”, where the Via della Lupa joins. There was a family near there called the Capilupi (or some such). The fountain is gone but the inscription survived. I saw it once, many moons ago. And, in that same courtyard, another fountain inscription warned that hands that had done violence or tongues that had uttered blasphemy were not permitted to touch the pure water of “the Virgin”. Also, in Elegiac couplets. How cool is Rome? Going across the river to San Pietro in Vaticano, we search in the right side aisle for the tomb of Pope Gregory XIII and the interesting relief on his tomb. It portrays the moment he was so proud of in his pontificate: when Clavius gave him the plans for the new calendar. One of the things you must learn to do in Rome is pay attention to details, which are really rather funny at times. These people had a wonderful sense of humor. What is interesting is the style of spectacles from that time, and that the sculptor included it. I haven’t gotten to the bottom of who this fellow might have been. The sculptor himself? The biographer of Gregory? Who knows? 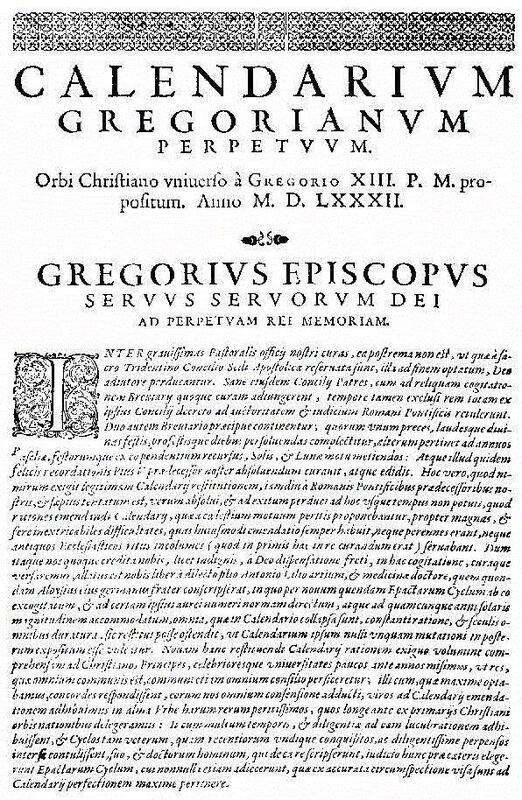 By the way, one of my favorites Pope Sixtus V (1585-1590, Felice Peretti) said: “Had the Jesuit order produced nothing more than this Clavius, on this account alone the order should be praised”. Clavius was an incredible mathematician who solved some of the most difficult problems of his day and who produced the essential textbooks of the era. Even the way we all learned Euclidian geometry when we were children is due mostly to the presentations of Clavius. His works were translated into Chinese by Matteo Ricci and others so that missionaries could connect with scholars in that far away land and thus bring them to the Gospel of Jesus Christ. This entry was posted in Linking Back, Saints: Stories & Symbols and tagged 1582, Christopher Clavius, Julio-Gregorian calendar, Pope Gregory XIII, St. Teresa of Avila. Bookmark the permalink. yes, Clavius SJ. The opinion of Pope Sixtus V is not to be put aside easily.